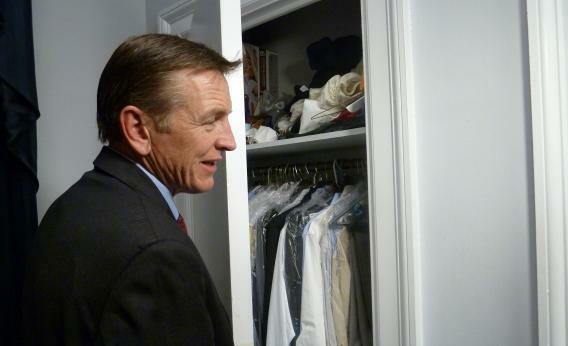 Congressman Paul Gosar, Republican of Arizona, opens his closet in December 2012, at the Cannon House Office Building. Photo by Raphaelle Picard/AFP/Getty Images. I will actively fight any attempt by this Administration to undermine our Constitution and infringe upon the Second Amendment rights of law-abiding citizens. With the attack on personal gun-ownership, the Second Amendment, and our God-given rights, the Obama-Biden Administration has been relentless in their pursuit of taking guns away from law-abiding Americans. On and on like this until Gosar says that “we must focus on reducing violent crime and keeping our families safe by encouraging our local communities to work with law enforcement and prioritize school safety” and “we should also devote resources to improving mental health services so that we can intervene early and curb violent behavior.” Oddly enough, among Obama’s actual executive actions are “providing law enforcement, first responders, and school officials with proper training for active shooter situations,” and “develop model emergency response plans for schools, houses of worship and institutions of higher education,” and “commit to finalizing mental health parity regulations,” and “launch a national dialogue led by Secretaries Sebelius and Duncan on mental health.” Of the 23 actions, seven deal with mental health or threats from people with possible mental problems. The actions that directly affect firearms all deal with enforcement or publicization of current law. Of the 10 declared legislative priorities that have to go through Congress – that Gosar will vote on – three deal with mental health, and three (an assault weapons ban, bans on “armor-piercing bullets,” bans on extended magazines) would restrict guns or ammo currently available to civilians. It’s actually sort of strange that Republicans aren’t asking, say, how much “a national safe and responsible gun ownership campaign” will cost. But you can’t campaign against this with a scalpel. You need an ax hot-glued to a blowtorch. UPDATE: The most-cited Republican of the afternoon is Marco Rubio, who doesn’t specify any of his problems with the executive orders. Making matters worse is that President Obama is again abusing his power by imposing his policies via executive fiat instead of allowing them to be debated in Congres. President Obama’s frustration with our republic and the way it works doesn’t give him license to ignore the Constitution. Well, that’s no good! I’ve asked Rubio’s office to enumerate the problems, but how is “nominating an ATF director who has to be confirmed by the Senate” an executive fiat? NBC News follows up on a “lawmakers not convinced story” by pointing out how non-existent the critiques are. The Senator thinks the President should be working with the Congress, not going around it.